S400, GT42, 3x3 4.62 Turbine outlet flange & clampWorks with 4" pipes Flange & v-b..
4.00" OD Elbow 90* 7.50" x 7.50"
4" Mandrel Bent 90 degree Pipe 16 Gauge .65 thou thick aluminized mild steel 4.5" R..
3.50" OD Elbow 90* 6.50"x6.50"
3.5" Mandrel Bent 90 degree Pipe 16 Gauge .65 thou thick aluminized mild steel 3.5"..
S300 BORG WARNER 20* Tapered DOWNPIPE FLANGE MILD STEEL 3.50" pipe fits in the I.D. 4.00" pipe..
V-Band Clamp T6 S400 / K31 exhaust 5.00"
Formed Steel Exhaust Outlet Flange for Borg Warner S400 and K31 turbo charger.5" outlet 5" V B.. 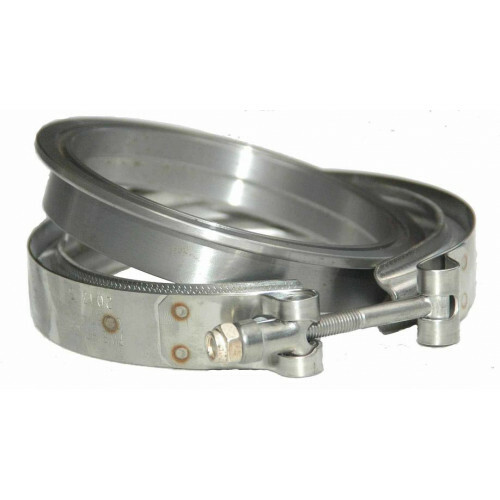 Stainless Diesel Gate Plate T-4 (Mounts between your manifold & turbo)	Used when plumbing externa..